Change Those Push-Buttons Next Week! Here's a curious record...it's a twelve-incher, pressed on early vinyl by Victor. The contents are thirteen radio commercials, dealing with the push-buttons on home radios and the problems that the re-allocation of frequencies would cause. The first six commercials were meant to be broadcast before March 29, and the remaining seven would be played after the change. Each spot has a little dramatized skit illustrating the predicted confusion of the average American, then an announcer comes in to explain what is going on. He also makes sure to tell the listener that the push-buttons could be reset by a qualified technician for a small fee. Of course, the tech would test the radio tubes too, and replace any that were in danger of burning out. And the announcer on the record finally tells the audience to listen to the local announcer, who'd drop a plug for some local RCA Victor radio dealer. When I got this record about twenty years ago, it made me wonder...what was this all about, and when did it occur? Bear in mind, there was hardly any Internet in the late 1980s. I certainly hadn't known anything about it. I knew even less about this frequency shift. Eventually I was able to determine that this record dated to 1941...and the NARBA (the old North American Radio Broadcasting Agreement, consisting of the United States, Canada, Mexico, Cuba, the Dominican Republic and Haiti) was responsible. You can find more info on this more-or-less forgotten footnote to American radio history here: http://broadcasting.wikia.com/wiki/1941_frequency_reassignments and http://en.wikipedia.org/wiki/North_American_Radio_Broadcasting_Agreement . We're fast approaching the 67th anniversary of this industry-wide re-allocation of radio frequencies. In both 1941 and 2008. March 29 falls on a Saturday! Enjoy them! Confuse your friends! Sorry about the annoying ads here...but free file-hosting isn't easily found. I may redo the file in the RapidShare site, but they've got their own troublesome quirks too. Who's the artist on this record? The singer is not terribly well-known, but those out there in Blogland who know this cat will recognize him easily. His style was unique...and still is. 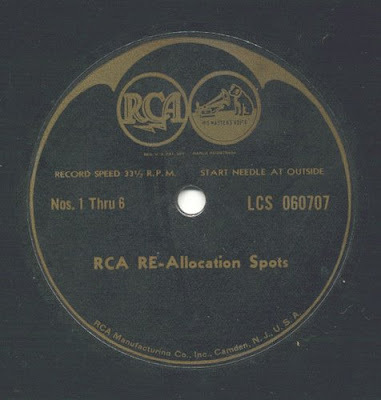 And, for a little gold star, what is the record session's significance? It is fairly important, in its own way. Until the next time...take it easy on those jellybeans, chocolates and marshmallow Peeps.